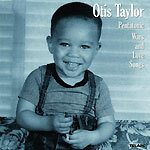 Turbula - Music - Review of "Pentatonic Wars and Love Songs"
"Pentatonic Wars and Love Songs" is the latest from Otis Taylor. The roots and blues performer has received considerable acclaim for his eight previous releases, including "Recapturing the Banjo" in 2008. His songs, all originals, often address social themes and many are called by Taylor "trance blues," since they can settle into a music groove and key and stay there for the duration of the song while he uses his interesting voice to weave an intoxicating lyrical spell. It doesn't always work effectively, but when it does it is uncanny, a sort of stream of consciousness that vaguely recalls stretches of Van Morrison's "Astral Weeks" if it were done in the blues. A somewhat more conventional approach is taken on "Looking for Some Heat," which has a loping bass riff as piano and cornet lines give Taylor company on the melody as he sings about traveling to escape the cold, but the pattern is established for much of the rest. Taylor sings his riff, and through the power of repetition, drives home a message. His daughter Cassie sings and plays bass on three cuts, including "Sunday Morning," which has a chord structure and changes beyond most of the other music here, and some nice acoustic guitar accents by Irish guitarist Gary Moore to go along with Cassie's refreshing vocal. "Silver Dollar On My Head" follows, using the same structure and key, speeded up slightly with Taylor on the mic; it actually works very well as Cassie contributes some nice background vocals. The pattern continues with "Lost My Guitar," very similar to "Dollar," but slower, and with some nice electric guitar fills by Moore. The real trance blues starts with "'m Not Mysterious," and for four tracks (23 minutes-plus) there is not a chord change or bass lick on the disc. These tunes are lyrically interesting and different from one another, with faster and slower beats and acoustic or electric emphasis, but the sequencing of them together tends to dilute the effect, with the best being the boogie "Young Girl Down the Street," which seems to be missing two of the three chords of the familiar 12-bar, but still generates some energy. Taylor's voice mannerisms after the fourth song seem very familiar. Cassie is back for "Mama's Best Friend," another long trance, trading off with coronet. For "Maybe Yeah," she sings a song that has an almost funk/R&B bass riff and sounds adventurous compared to most of the stuff before and after it; still, it repeats the lick for four minutes without taking it anywhere. "Dagger by My Side," an acoustic solo piece with some nice acoustic guitar playing by Taylor, would have worked better if placed earlier in the song sequence. The closer is "If You Hope," a fully produced tune with a conventional structure and Moore featured on guitar as it builds up. This one shows that Taylor can achieve trance blues while having a melody, just stretching the song out. "Pentatonic Wars and Love Songs" is different, and provocative. It is trying to be.